Hi! 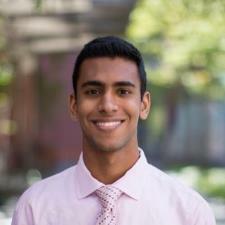 I'm Kavi, and I have been tutoring with Wyzant for three years. I am a junior at the University of Pennsylvania, currently intending to major in finance and business analytics with minors in computer science and data science. I have a wide variety of interests and enjoy taking many different types of classes. I tutored at the school tutoring center throughout high school, helping my fellow students with homework, concepts and test prep in several different subjects including math, chemistry, physics, and Spanish. In addition, I volunteered at the Kumon Learning Center, assisting students in grades K-12 with math and reading. Currently, I tutor middle school students through the West Philadelphia Tutoring Project, a student group at my university. I love being able to help students of all ages improve their performance in the classroom as well as give them new skills to succeed in the future. I am open to resources and suggestions, and I am part of a generation that is maybe too easy to reach. I'm excited to schedule a lesson or respond to any questions you may have! I received an A grade in introductory college Java course and an A grade in intermediate/advanced college Java course. I have taken 6 consecutive years of Spanish classes, 2 at the college level. I have received an A grade in every class. I also tutored in Spanish at my high school's tutoring center. Achieved an A+ grade in Algebra 1 and Algebra 2. Also received A grades in Geometry, Pre-Calculus, Calculus AB, and Calculus BC. I received A grades in Algebra 1, Algebra 2, Calculus AB and Calculus BC. Math is my favorite subject to tutor and I've tutored high school and college students in all four of these subjects. I received a 5 on AP exams in both Calc AB and Calc BC. I completed Calculus 3 in college. I received an A+ grade in high school Precalculus class and completed 3 levels of Calculus classes. Scored 750 on Math section of SAT. Scored 800 on Math II SAT subject test. I have just completed my freshman year in college. When applying to colleges I paid for a professional college counselor to give advice and tips about applications and essays. This year I lent that advice to many students in the year below me by editing college-specific and common app essays and giving advice about filling out the common app and separate applications, as well as sticking to deadlines to get the applications submitted on time. Kavi is very patient with me and will go over materials as many times as I need them reviewed. He also teaches me other ways to do a math problem that are easier for me than the way my professor has previously taught me. Kavi is great at explaining a variety of topics and makes it easy to understand. He is very patient and willing to spend the time that is necessary to help you succeed. Kavi connected easily with my son on his first Spanish lesson and he is looking forward to future lessons. Thanks!